This tale of disparate people coming together to grant one another a bit of peace, the opportunity to find their places at the table, begins with brother and sister James and Alice Stone, who in their adventures in the woods, stumble upon a man’s body. He is African American, and he has been lynched. The children, who are also African American, have good reason to be frightened. This is 1920’s North Carolina. Although they live in Emancipation Township, an African American-owned town, just outside their familiar neighborhoods, racial terrorism waits. Although the pair hides, they overhear men in the woods discussing the lynching. What James decides to do will alter his life. His family decides he is in too much danger to stay. He must be sent to relatives in New York. Suddenly, the reader is introduced to Bobby. Although he is also a Southerner, he’s white, he’s from Georgia, and it is the 1970’s. He is the son of loving but very religious parents. And he is gay. The older he grows, the most sure of this he is, and he is hounded by his bullying older brother, who is repulsed by him. He, too, must escape. And it is only through the love of his grandmother and her life-long industry in making and selling the best pound cakes on the planet that he finds the money to flee–to New York. Bobby has always been interested in food, and in New York, he has the chance to become anyone, including a top-notch chef. So, with so many years separating these two Southern stories, how can they come together in a meaningful way? The reader isn’t sure until an entirely new character enters–Amelia Brighton. She’s not from the South, but only hails from nearby Connecticut. But she, too, is dealing with a painful relationship as her husband conducts an affair and her marriage is crumbling. Which of these characters finds a place at the same table and in what way is the heart of the story. How they help one another and learn to accept themselves and the trajectory of their lives is a lesson for all of us who are struggling with our identities and our pasts. High school housekeeping: I think this is a good choice for high school students who are reading at grade level. You might feel a bit confused as one story disappears and you are jolted into another–the transitions don’t exist–but just keep going forward. I think many teens deal with the kind of issues that are addressed in this novel–racial issues, family tensions, coming out of the closet, mending friendships and being open to new relationships. 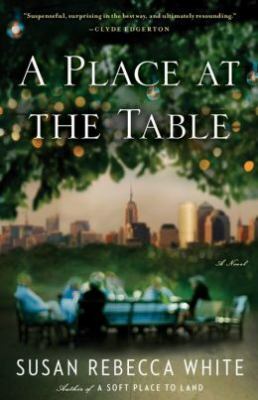 In addition, there’s a historical element to A Place at the Table–you’ll get a good feel for the places and times that the novel has as its various settings. Plus, you’ll empathize with the characters. All in all, well worth your time. This entry was posted in bullying, Faith-Based/Religious Element, Family Problems, Fiction, Historical Fiction/Historical Element, Multicultural and tagged 1920s, 1970s, A Place at the Table, Adult books for teens, African Americans, book reviews, bullying, child-parent relationships, coming of age, Georgia, LGBTQ, New York, North Carolina, Southerns, Susan Rebecca White, The South in fiction. Bookmark the permalink.